Spring has sprung at my house! The robins are back and I saw my first katydid yesterday. And...with Easter only a few short weeks away, it's time to get my crafting on! So I am excited to share my latest project...my moss-covered Easter eggs! And they were easy and inexpensive to make...always a plus! Cover the egg completely with Mod Podge using the brush. I learned the hard way that it's best to do this in a different area from the moss. Yikes! Piece together enough of the moss to cover the egg. My moss had a layer of dead moss and dirt on the back that I removed first. Using a paper towel, press the moss into the Mod Podge and hold. You may find that you need to add a little bit more moss to cover any empty spots. Finish it off by tying a strand of green thread around the middle and then looping it over the egg several times and in several directions to secure and flatten the moss. I tried unsuccessfully to leave one end of the thread loose so that I could tie it back when I was finished, but it got caught in the other loops. So instead, I simply added a bit of Mod Podge on the end of the thread to hold it in place. (Don't worry...it dries clear.) Now let the eggs dry overnight. If you wish, you can cut away any long or loose pieces of moss. Just be careful not to cut the thread. Taaa daaa! Here it is! Now just add a springy ribbon to finish it off if you wish. I'm already thinking about Easter brunch and planning to add my eggs to the table, nestled in these cute little nests. 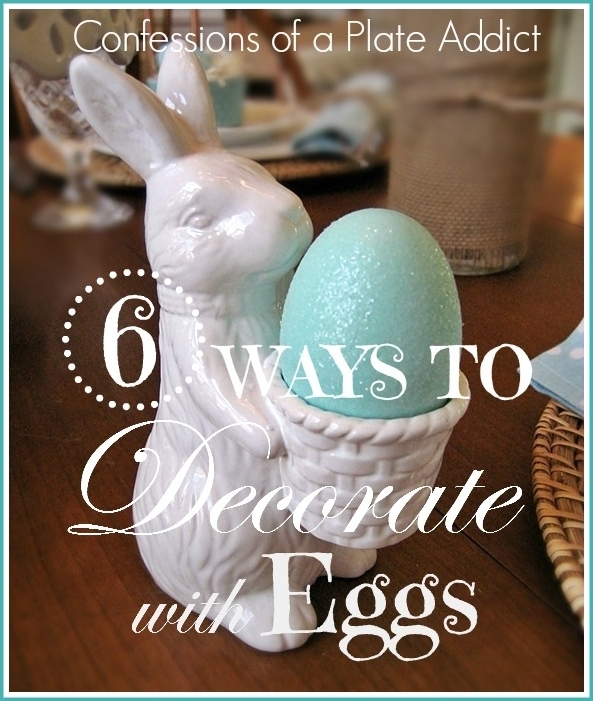 And if you love using eggs in your spring and Easter decor like me, I'm sharing SIX WAYS TO DECORATE WITH EGGS...starting at the front porch and including everything from wreaths to centerpieces! And stay tuned because I have more Easter ideas up my sleeve! You are so talented! Very cute eggs! Those are absolutely adorable! I think they would make a great display even after Easter.